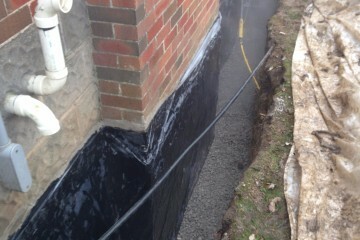 Mud Monkeys offers a 20 year transferable warranty on all of our waterproofing. We use no heavy machinery or bobcats to excavate our holes, everything is done by hand (shovels and wheel borrows) in hopes to keep things as less invasive as possible. We ensure our customers have a great experience from beginning to end. As a company we have been solely based out of downtown Toronto for about 20 years. Prior to that Darby has years of experience in the waterproofing and structural fields. 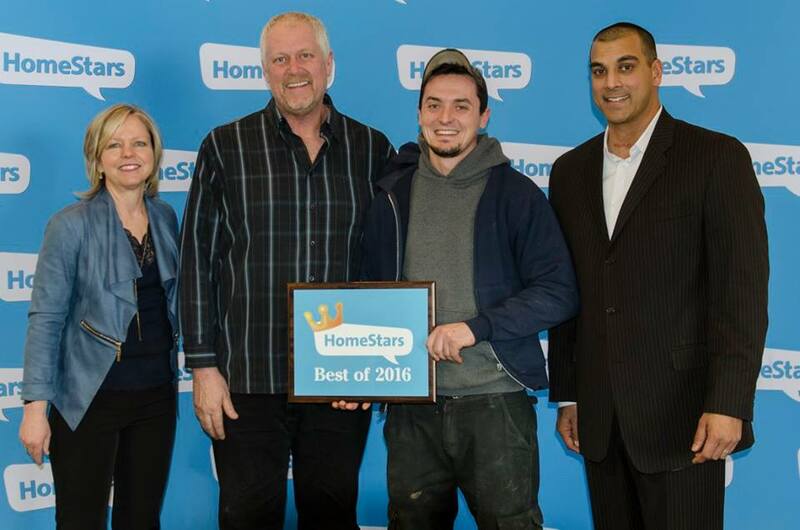 The majority of our business comes from word of mouth in surrounding communities, neighbors and Homestars reviews. We are very familiar with all the different types of foundations in the area especially century homes. We hired Mud Monkeys to waterproof our leaking basement in our century home. The guys were friendly and processional and, more importantly, true to their word. We had some problems with the waterproofing another were tenacious in responding to issues and finally sourcing and solving the problem. We would not hesitate to recommend Darby and his team. We had Mud Monkeys do some waterproofing on the exterior of our home in July 2013. Their work was great and quick. They're response to our queries and needs was outstanding. They went above and beyond. 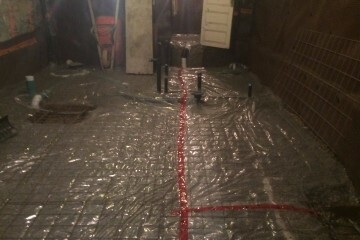 We also had them put in a sump pit as well as weeping tile and a new floor in part of the basement. Again they did great work. I would recommend Darby, Nick and their crews to anyone. Darby is honest and very courteous. The work was done punctually. It was a very positive experience in that they were considerate and the parging, which was tricky to get at, under a deck, actually looks beautiful. They were thorough. And the price was reasonable. What else is there to say? These guys are great. They helped us renovate our old damp, moldy basement by excavating, waterproofing outside and in, and build an exterior entrance to our basement. Darby worked closely with our contractor to cut the new door way and a new 40"X58" window in our front brick wall. Always on time, always on budget. Darby was personable and a great resource for other reliable professionals and trades. He helped us to problem solve around a number of issues and satisfy the concerns of the bulding department. Our basement is now, dry, deep and warm. We are absolutely satisfied with the quality of the work and with the experience of working with Darby and his crew. His word is his bond. Derek Thomson and Suzanne Deuel in Toronto - Excavating, waterproofing, prep for infloor heating, build an exteror below grade entrance. Tired of mopping the water in your basement? Does your basement smell of mould and mildew? Is your foundation wall retaining water slowly and deteriorating? If the answer is yes to any of these questions, then the following will describe the reasons why, and how, to eliminate the problem. The Cause of your basement’s musty smell is because your foundation wall is retaining water, be it in the hollow block cavities or trapped behind the double brick or stone wall, as well as the water that is absorbed by the block, brick and stone. This combination causes the wall to produce mould, mildew and epharecense. The water trapped in the wall slowly deteriorates the wall, starting at the bottom. The water that makes its way into the basement through the wall and seems to cause us the most grief may not be the most concerning problem. The same problem will not occur with a solid poured concrete wall. The reason being you will find a defined crack in the solid wall that allows all the water to enter in, without retaining little, or any water. Regardless of which type of foundation you have, it can become watertight, mould and mildew-free by sealing your foundation from the OUTSIDE. Sealing your wall from the outside is the only way to assure that the exterior elements stay out. You must expose your foundation wall from grade level to 6″ below the top of the footing. Then you must clean the wall thoroughly, exposing the deteriorated areas and cleaning all the dust and dirt from the wall. Then, restore any cracks or loose mortar joints with hydrolic cement. 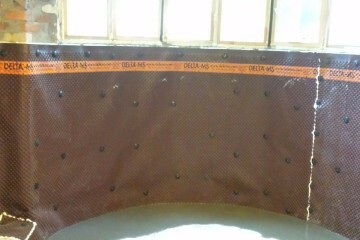 Cement coat the wall with 6mm poly plastic on top. Once the wall is treated, install a 4″ continuous weeping tile covered with 6 inches of 3/4″ stone. Then back-fill the earth compacting at every foot. At grade level slope the earth, concrete, interlocking etc. away from the house. This method never fails. I have used this system over 1100 times without fail. I have the references for you to refer to. We also have a photo album to take you step by step through the procedure. So, stop mopping! Relieve your allergies from mold and mildew and restore your foundation. When you do decide to restore your foundation do it the right way – from the outside. Remember, 40% of all my work is fixing other people’s attempt to stop the water. At Mud Monkeys, we take pride in our work and our customers agree. Please read our customer reviews.